Andrew N. Goldfarb is an experienced litigator who focuses on food and drug law as well as plaintiff- and defense-side complex civil litigation. represents a leading tobacco control organization as an amicus in litigation and in FDA regulatory matters arising under the Family Smoking Prevention and Tobacco Control Act. defended an individual in a criminal prosecution relating to the alleged promotion of fraudulent tax shelters by a major accounting firm. Andrew is co-editor of Suits by Suits, a legal blog about controversies involving executives and their employers. Prior to joining Zuckerman Spaeder, Andrew was a trial attorney for six years in the U.S. Department of Justice, where he prosecuted the United States’s civil RICO action against the tobacco industry that resulted in a 1,650-page opinion finding the defendants liable for RICO violations. 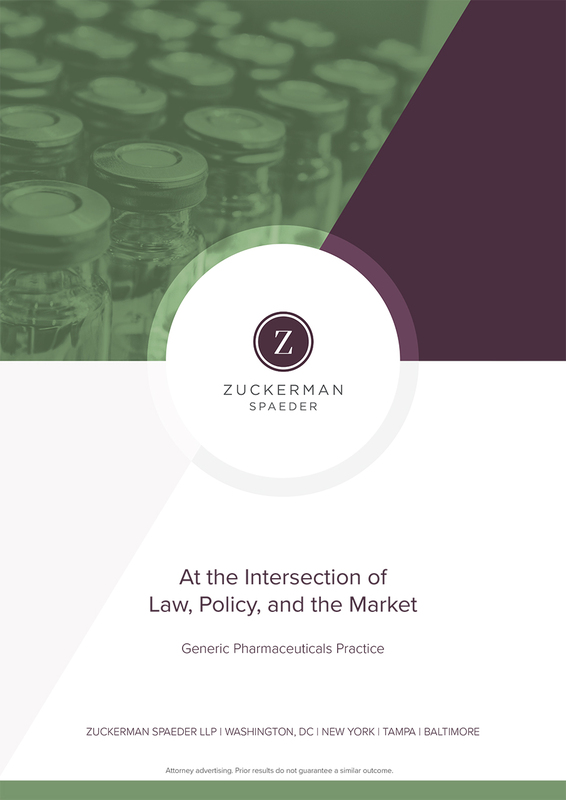 Recently filed comments to FDA on behalf of a pharmaceutical and medical device company concerning the scope of orphan drug exclusivity. The company responded to an FDA solicitation in the wake of a district court decision requiring FDA to award orphan drug exclusivity to a designated orphan drug, even though the drug had not shown “clinical superiority” to a prior orphan drug with the same active ingredient for the same use. It argued that orphan exclusivity should apply only to ANDAs referencing the new orphan drug, but should not keep ANDAs referencing the prior orphan drug from receiving marketing approval. FDA has appealed the district court decision; a decision from the Court of Appeals is expected in mid-to-late 2019. Representing patients in a class action lawsuit against major insurance companies for their failure to cover an FDA-approved mental health treatment. The plaintiffs allege breaches of fiduciary duties and wrongful denial of benefits under the Employee Retirement Income Security Act (ERISA). Representing a putative class of patients in an action against a major insurance company for allegedly discriminating against out-of-network psychiatrists and other mental health providers in the reimbursement for mental health services. Plaintiffs allege that the insurer’s policy of reimbursing mental health providers less than non-mental health specialists for providing the same services violates ERISA and other laws. Defending an electrical switch manufacturer against tort, contract, and fraudulent conveyance claims in parallel state and federal bankruptcy court actions arising out of a purchase of assets from a company found responsible for environmental contamination in Long Island, New York. Represents a leading tobacco control organization in litigation and regulatory matters arising under the Tobacco Control Act (TCA), including representing a coalition of health organizations as amici in a challenge to FDA’s “deeming rule” concerning electronic cigarettes; and counseling on proposed and final rules on issues arising under the TCA, including tobacco product applications, warning labels, and substantial equivalence. Conducted an independent internal investigation for a major international pharmaceutical company, after the company failed to disclose to the FDA a preliminary report of a drug safety study before an important advisory committee meeting. The drug had been approved by the FDA to reduce bleeding in certain cardiac surgery patients. After conducting dozens of interviews of all of the key participants in the events at issue, in the United States and Germany, and conducting extensive document discovery, Zuckerman Spaeder prepared a report detailing the critical events and potential causes of the company’s failure to disclose. Represented the official committee of unsecured creditors of the Tribune Company as special litigation counsel in the investigation of the $10 billion failed leveraged buyout (LBO) and the commencement and initial prosecution of three lawsuits against major lenders for fraudulent conveyance; directors and officers, former Tribune shareholders, and others for breaches of fiduciary duty and fraudulent conveyance; and financial advisors to Tribune for malpractice. Co-authored a U.S. Supreme Court amicus brief on behalf of former federal district court judges in California Public Employees’ Retirement System v. ANZ Securities, Inc., concerning the impact of the American Pipe tolling doctrine on securities class action litigation in district courts. Represented a post-confirmation committee in a suit against a leading private equity investor to recover funds on behalf of unsecured creditors of a leading toy retailer. The defendants had engineered a leveraged buyout of the company that burdened the retailer with an unsustainable debt load while the private equity firm extracted substantial returns in a very short period. Zuckerman Spaeder obtained a favorable settlement for the creditors. Representing a post-confirmation liquidating trustee in a contract dispute against certain former lenders of an investment management firm. The trustee seeks damages for the alleged violations by minority lenders of a collective enforcement/“no- action” provision in the loan documents. The loan documents gave exclusive authority to a collateral agent to enforce the loan’s security interests in the event of a loan default by the borrower. Served as class counsel for millions of consumers in Maryland and Virginia who sued gas stations and oil companies over alleged deceptive practices in the retail sale of gas and diesel fuel. The class claimed that retailers sold gas to consumers without adjusting the price to take account of lower fuel content of higher temperature gas. The cases were consolidated for pretrial proceeding in a multidistrict litigation proceeding in the U.S. District Court for the District of Kansas. The class settlement provided significant injunctive relief to the class. Certain defendants have appealed parts of the settlement to the Tenth Circuit. Represented the litigation trustee of a bankrupt retail mail order company in an accounting malpractice action against KPMG. The trustee alleged that KPMG’s negligent audit caused the company to continue operations after it would otherwise have filed for bankruptcy, deepening its insolvency and injuring creditors. After extensive discovery, including the taking of testimony from German directors and officers under the Hague convention, the parties reached a favorable settlement. Defended a chain of yoga studios against claims that it was a racketeering enterprise in violation of RICO and Virginia law. The plaintiff alleged that the company engaged in practices that diminished his ability to exercise free will and independent judgment and induced him to dramatically change his lifestyle and pay significant sums of money to the company for services. The U.S. District Court for the Eastern District of Virginia granted the defendants’ motion to dismiss on the grounds that the plaintiff had not adequately pleaded a RICO enterprise distinct from the defendants themselves, and declined to exercise supplemental jurisdiction over the plaintiff’s state law claims. Defended a data vendor to a major retailer in a putative class action arising out of a data breach. A laptop computer containing personal information of job applicants was stolen from the vendor. The plaintiffs claimed they were injured by the increased risk of identity theft, although there was no evidence that the breach resulted in actual identity theft. The client prevailed on summary judgment in the U.S. District Court for the Northern District of California on the grounds that the mere threat of future injury was not sufficient to impose liability under California law. We briefed and argued the appeal for the client before the U.S. Court of Appeals for the Ninth Circuit, which affirmed the district court’s decision. Acted as co-counsel to the lead defendant in the prosecution in the U.S. District Court for the Southern District of New York of former partners of Ernst & Young and others for allegedly promoting fraudulent tax shelters. Co-authored a U.S. Supreme Court amicus brief for the Campaign for Tobacco-Free Kids regarding constitutional limits on punitive damages. The amicus brief focused on the reprehensibility of Philip Morris’s conduct. Assisted a woman seeking to maintain sole custody of her children in the District of Columbia. Can an Employer Back out of a Promise to Provide Advancement by Claiming That the Employee Committed Fraud?